A big thank you to Madame Samm for such a lovely pattern and clear instructions, and to Katherine for all her time to get us all organised. When I've made purses before, I used the frames for gluing, so I was a bit nervous about the stitched in method. I needn't have worried, it was all plain sailing. I made the orange version first, then was straight on the lookout for the next one. I used the fabric leftover from the Lynette Anderson quilt. This pattern is perfect for using up small pieces of fabric and batting, and you end up with something perfect for gifts. I have bought some more frames, and have the fabric chosen for two more purses. I have two more to choose fabric for. If you would like to make some yourself, Madame Samm is very kindly offering the pattern for sale, just contact her at madamesamm@me.com, with coin purse as the subject. 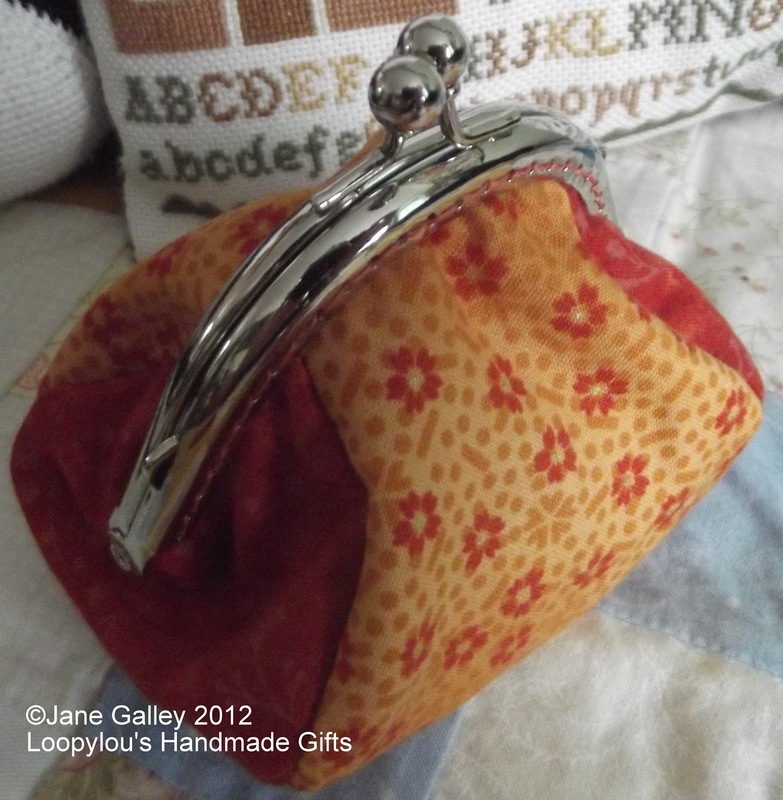 I will be having a giveaway, you can choose from one of my completed purses. I will pick a winner on Tuesday 13th, November. If you would like to take part, please let me know in your comments. Darling! You chose the sweetest fabrics for your coin purses. Someone is going to be very lucky to win one of these beauties! Thanks so much for being a part of the hop. Those are so cute! The sewing-in method isn't so scary once you've done it a few times, is it. Excellent way to use up those scraps! Hi!!! These are very pretty!!! I would love to win and thanks for the chance!!! 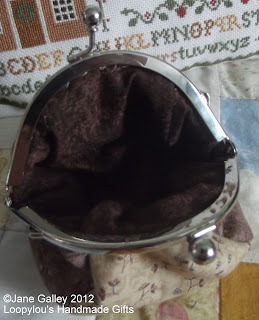 Adorable coin purses...would definitely love to be included in your sweet giveaway...TFS! Great job on your coin purses! Orange is my favorite color. Thank you for sharing and the great giveaway. I follow via email. jbechosend at sbcglobal dot net. Just lovely fabrics for such very pretty purses! Thank you for sharing. 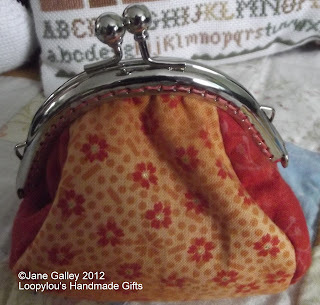 Lovely purses, it really is a great pattern for using up small scraps. I was worried about the sewing in part too and was surprised and relieved when it went so smoothly! I love your orange purse. Bright things are so great! I would love to take part. I don't really get blog hops: I could never take part, my be fuzzled mind would struggle, but it is always great to see new blogs! Lovely, lovely purses. Is there no end to your talents? Very cute fabrics, nicely done! Nice fabric choices for your coin purse. Wonderful coin bags. They would make great gifts. Both are just as cute as can be...thank you for sharing them with us. And yes I would love to win one...Have a great day! They turned out great. Weren't they fun? Lovely! I was afraid of the sewn in method myself, but the hardest part was choosing the floss. Super cute little purses. You did a perfect job of attaching the clasp. Those have holiday gifts written all over them! Very cute. Love the colors you picked. I think stitching would be easier than the gluing. These are wonderful! I can certainly see these as great gifts for my daughters and girlfriends. I am going to have to go buy this pattern for sure. How adorable! Great fabrics too! These are so cute! Great job!! I'd love to win one of these. Both are beautiful but the bright orange one would be my preference. Fingers crossed! Very nice fabric choices for your little purses! Would love to win one! so little purses are so sweet and how nice of you to share with someone. I would love a chance to win one. thanks for sharing. 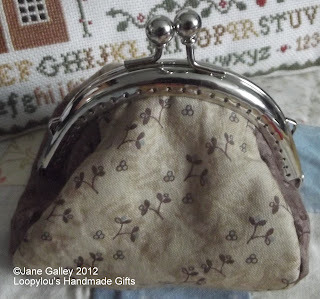 Very pretty little coin purses. I would be thrilled with either one. thanks for the great giveaway. Love the frames you used! Just beautiful purses! Your purses are just darling and I love the curved frames. I would be thrilled to be included for a chance to win one. Jane, both purses are absolutely lovely. You did a marvellous job on them both. 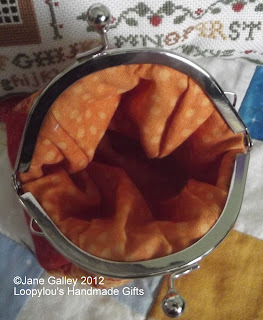 I love the warm looking colors in your little coin purse--very nice! Gorgeous purses. Thanks for sharing. I like your little purses, and would LOVE to win one. Thank you. Such a wonderful job. I love your fabrics! I had problems with the hand stitching too! Second side was much easier! Lovely purse. I never manage to have any success with frames. Your fabrics are so pretty and dainty. The purses turned out great. Lovely purses! I love the fabric. I had a nightmare sewing the frames on!! please don't enter me for the giveaway though, I'm part of the hop and have purses coming out of my ears! JUST ADORABLE! I'D LOVE TO WIN ONE OF THESE! THANK YOU! Gorgeous fabrics! Thanks for sharing your creations with us today! Love the purses and the fabrics used. Thank you for the opportunity to win one of your beautiful coin purses. Your purses are adoreable. I really like the framse. I would LOVE to be included in the giveaway. I would love to win one of your little purses...they are so cute! I bought the pattern (I'm not in the hop) but have not had time to try it yet. I love your fabric choices! Would love a chance to win. thank you ! Sweet purses... I'm not in the hope, but have purchased some frames to day. It looks fun. I am glad you had an easy time with the stitch in version, I was a bit nervous before trying my hand at it as well! Yeah that's pretty cute, can't wait to show you mine! Thank you!!! But surprise me if I'm totally lucky enough to be the winner!! You made the sweetest coinpurses, cute fabric, thanks fort showing. Love your fabric choices! I would love to be included in your giveaway! Thanks! 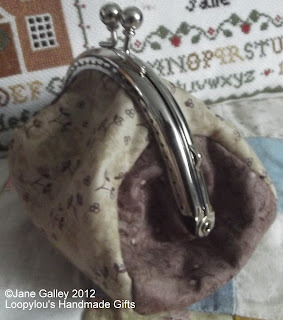 Lovely purse , your fabrics are a perfect choice , thanks so much for the chance to win . I would love to win one of your coin purses. I have ordered frames and waiting for them to arrive. You've chosen great fabrics. Thanks for sharing your lovely bags. Your purses are very nice! I like the bright colour of the orange one. Please include me in your giveaway. Your purses are just fabuous! Love the little grey one, so very sophisticated! How many times can I say cute??? Love the pretty fabrics you picked for your two! I am part of this fun blog hop too, but oh yes, please include me in your giveaway! I am at our daughter, son in law, and grandbaby's home visiting, but wanted to stop by and check out the amazing coin purses! Such fun coin purses. They are so addicting, I think. Those are sweetest.Thanks for sharing!! absoutely gorgeous and perfect purses. Wonderfully sweet fabric on those purses. I have the pattern and so I know I want to try one. Thanks for the chance to win one. A giveaway is always fun!!! I love these little coin purses.. I have have to check for the pattern! Than you for sharing your talents! Very sweet, I love them both and would be happy winning either. Great job on your coin purses...like everyone else, I'd love either one! Cute little purses. Thanks for a chance to win. Cute cute cute, I am so anxious for my day to show off mine. Thanks for a chance to win one of yours! Could this be a new collection starting? Beautifully stitched...luv the orange and I luv Lynette Anderson's fabrics. If I am the lucky winner, it would be hard to choose. I would let you surprise me. Thanks for sharing in the blog hop. Such pretty purses! Thanks for the opportunity to win. Great job, they turned out fabulous! Both purses are so pretty. I love making these little purses. Your coin purses are so cute. I would love to be the winner of the giveaway. I especially like the orange one. Darling wee purses! I'c love to be entered in your giveaway. Thanks for sharing with us all. I would be honor to have one.. for my little sissors and thimble or change.. Thanks for sharing your cutie purses with us! What cute change purses! I'd love to have the orange one--I do not buy orange things but this is too cute! I love the orange purse and would be very lucky to have it! Hope I'm not too late to win! Love the fabrics you chose.